PS Ruby in dock at Wentworth. Photo: D Payne. Every year the museum awards various grants through its Maritime Museums of Australia Support Scheme (MMAPSS). These can take the form of financial assistance or in kind support, for which museum staff travel to the institution involved. This is an excellent outreach opportunity for the museum, and being onsite greatly improves the quality of the work its staff can do. As Curator for Historic Vessels I travelled well out into regional New South Wales to work with two of the successful recipients in the most recent round of grants. I was visiting two very different craft: the 107-year-old paddle steamer PS Ruby and an oyster punt built by Gus Cole, possibly as early as 1918. For both craft my task was to develop a Vessel Management Plan (VMP). This vital document creates a handbook about the vessel’s background, significance, conservation, interpretation, display and operation. At the recent 2015 Conference for the Australian Maritime Museums Council, Rob Bowring from Mannum Dock Museum, which manages PS Marion, simply called it a ‘bible’ that guides these aspects so that they work together to achieve the desired outcome, and everyone involved is ‘on the same page’. 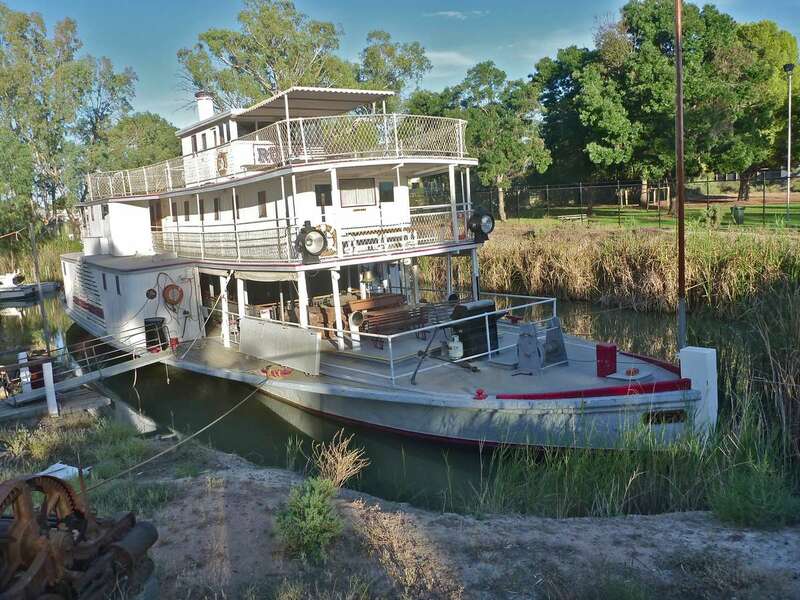 PS Ruby operates out of Wentworth in southwestern New South Wales, where the Murray and Darling rivers converge. 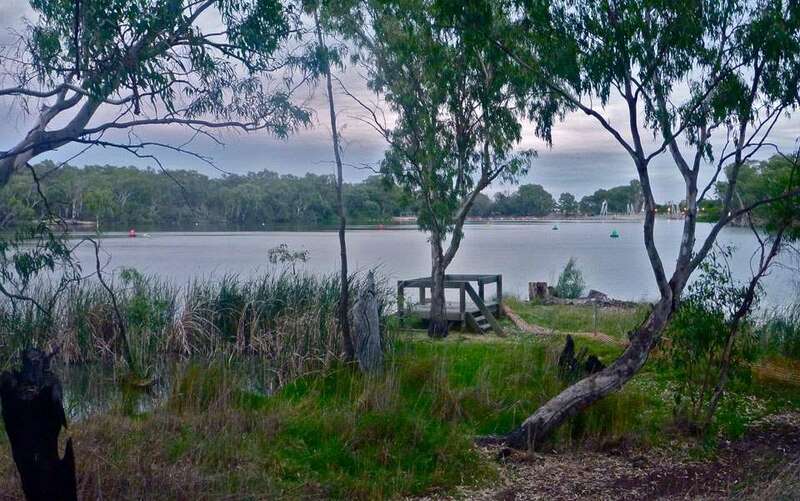 It’s a picturesque location; at this point the Murray is wide and as it ambles across the country the Darling comes down to meet it from the north. Over its last kilometre the Darling takes a sharp turn west to run parallel to the Murray, before easing itself into the Murray’s flow. There at Wentworth they become one big river, soon to turn southwest and head for Goolwa in South Australia. The Murray left and the Darling right converge at Wentworth. Photo: D Payne. PS Ruby was built at Morgan in South Australia in 1907 for Captain Hugh King by David Lowe Milne. PS Ruby is 39.85 metres long with a beam of 5.71 metres. PS Ruby’s outstanding feature was its very light draught of between 2 feet 6 inches and 3 feet (0.75 m and 0.915 m) when fully laden at around 85 tons. This enabled PS Ruby to operate on much lower river levels than other steamers. PS Ruby carried 30 passengers in style and comfort and had three decks. It was one of only a few paddle steamers specifically built to take passengers. PS Ruby Profile 2015. Drawn J Fautsman and revised D Payne. On a Sunday afternoon I went over the vessel with Bill Nicol from the PS Ruby Board and Peter Trevathan, who is employed by the council to manage PS Ruby. He is a real hands-on enthusiast who knows the steamer and its machinery in very fine detail. It now has a 20 nhp Robey engine installed, built in 1926, replacing the original 1907 engine. This newer model has required some time to bed down. Peter consulted with one of the old hands from upriver, and together they gradually tuned the parts to have it all working smoothly. I spent a long day on the Monday with Peter, working together on computers in the mid-deck saloon of the vessel, developing the VMP to a point where the board and Peter can fill in or expand on various sections. A key part is quite simple – identifying that the paddle steamer is to be conserved and interpreted to show how it was from 1915 to 1920, its heyday as a passenger vessel. PS Ruby is in survey and can carry passengers again. It is operating monthly at present but looking for opportunities to do more. A vessel management plan is also needed for maritime survey with regard to any application for a heritage exemption that concerns managing an aspect of the vessel’s survey requirements. Wentworth was once one of Australia’s busiest ports, rivalling the coastal centres. Huge amounts of produce came to the town by land and river, to be sent down by paddle steamers as far as Goolwa and then on to the coast. On their journey up the river the steamers carried goods, supplies and passengers who were accommodated on a number of the steamers. It was a strong economy. The oyster barge in the collection of the Merimbula Imlay Historical Society (MIHS) is quite a contrast in many ways – much much smaller than PS Ruby and without the complications of machinery, operation and survey. It is only on display, so the VMP concentrates on significance, conservation and interpretation. It’s still a bible as such, containing what is needed to conserve and manage the punt as it remains on display. One task was to inspect another punt with MIHS committee members, which was recently brought to their attention. I recorded its dimensions of this wooden scow-shaped barge, and with the owner began the process of nominating it for inclusion on the Australian Register of Historic Vessels (ARHV). From there I went to the nearby coastal town of Eden, near the border with Victoria, to visit the Eden Killer Whale Museum. This well-known tourist destination is home to Tom the orca, who was the ringleader for many years among the three pods of killer whales that seemed to work in tandem with the local whalers. 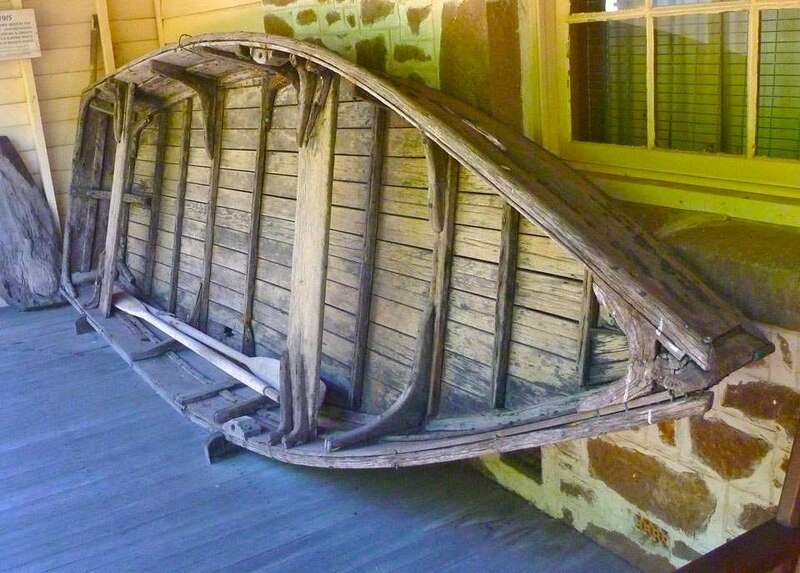 There is also a small selection of craft on display, including a dinghy built by the region’s best-known shipwright, Ike Warren, and a pram-shaped skiff that worked the oyster leases and acted as a pilot boat on the river at Pambula, just to the north. Both are destined for ARHV consideration. I also met with representatives of a group formed to build a replica of Ben Boyd’s schooner Wanderer from the 1840s. Scottish-born Boyd was an Australian grazier, entrepreneur, whaler and fleet owner in the first half of the 19th century, and Wanderer was Boyd’s grand vessel when he settled Boyd Town, opposite Eden. The project was at an embryo stage and it was useful to discuss their plans and recommend some actions based on the museum’s experience in this area. Gus Cole’s oyster punt. Photo: D Payne. We undertook a detailed review of the punt’s structure and dimensions, then developed a vessel management plan to help them display, interpret and conserve the craft, and develop the story of its significance. It was built locally by Gus Cole, and has a sharp stem and a flat bottom. Simply but effectively put together, it has survived for decades. Its age shows, but it is stable, almost completely original and a wonderful connection to Merimbula and its oyster industry. Merimbula with oyster leases in the foreground. Photo: D Payne. Australia has a great abundance of oysters. Around Merimbula, Aboriginal people from the Yuin nation harvested them each season. The modern industry began first near Pambula, and then after World War 1 it was established commercially in Merimbula. It survives today as major industry, though these days it’s serviced by aluminium punts with a scow or barge shape, their wooden counterparts almost extinct. The two recorded here make three in total noted on the ARHV, and it is anticipated that more will be located and we will end up with a diverse range for comparison. Oyster leases on Top Lake, Merimbula- and yet another wooden oyster punt, probably c1970s, with its present day minders. Photo: D Payne. Our two MMAPSS visits to Wentworth and Merimbula were well received. They show the museum’s ability to move out from Sydney and extend its support to the regional institutions and to less well known aspects of maritime culture, and in this instance they leave two groups with detailed vessel management plans to help them manage their craft into the future. Find out more about the Maritime Museums of Australia Support Scheme (MMAPSS) or explore our Australian Register of Historic Vessels (ARHV).